The USD is acting stronger against NZD due to its economic reports, however NZDUSD is also under the influence of the French Election. The support rests in 0.70230 with resistance at 0.70530 which the monthly pivot point at 0.70270 is located in between the lines. The EMA of 10 is moving with bullish bias and it is above the EMA of 100 and the EMA of 200. The RSI is falling towards the 50 level, the MACD indicator is in neutral territory and the Stochastic is showing downward momentum. The ADX is showing buy signals. The price is above the Ichimoku Cloud and below the Chinkou Span. The Tenkan-sen is showing an upward trend while the Kijun-sen is showing a horizontal trend. 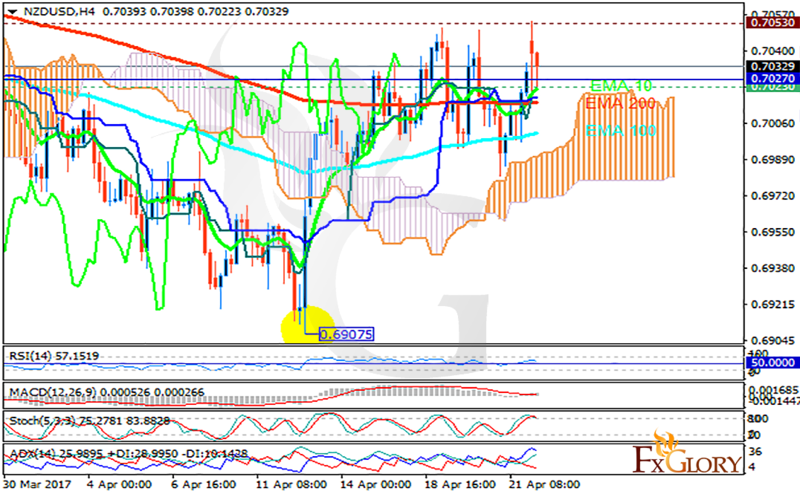 The support line seems to be strong to be broken therefore long positions are recommended targeting 0.7050.